I'm extremely jealous of the fact that our helper Kayla has been enjoying strawberries for nearly a week. The photo above shows our most-ripe berry, proof that it may be another week before we join her in berry heaven. We got set back by allowing some of our strawberry flowers to be nipped by a hard freeze, so all I can do is wait impatiently for the first color to appear on my favorite fruit. Even though I'm behind in the berry department, the garden is brimming with life. 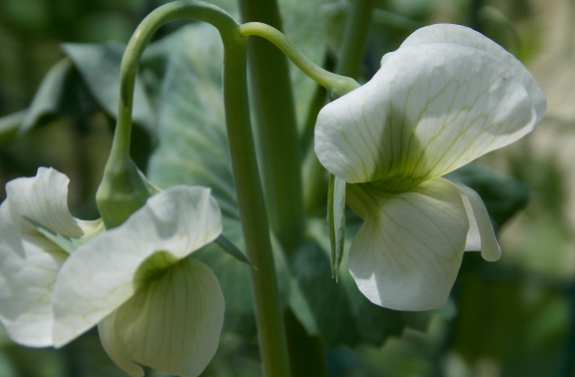 Our peas have just started to bloom, so we'll soon be enjoying those crunchy pods, which is good since lettuce and kale are now on their way out. Other coming attractions in the next few weeks include Swiss chard and broccoli. 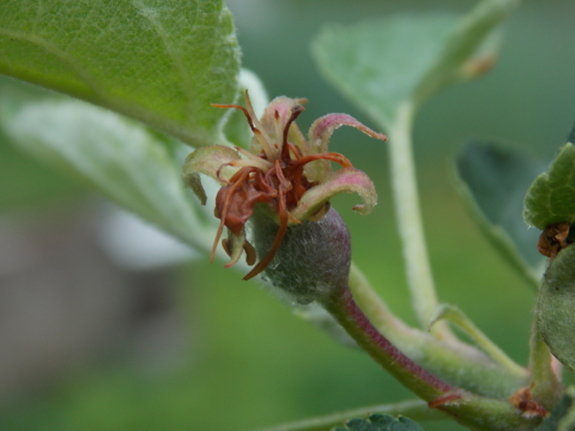 I was also excited to notice that a few apple ovaries seem to have made it through the hard freeze. At this time of year, fruit trees drop the flowers that were damaged or which the plant doesn't think it has the energy to turn into fruit. Usually, I would be thinning further to ensure trees aren't too overloaded, but this year, I'm just glad to see a few flowers sticking and promising autumn morsels. How's your spring garden growing? I'm still waiting on strawberries, too, but mine are at least a little pinkish. Techincally mine are June bearing, but one of the pots they are in didn't have much soil, so there's a good six inches between the soil level and the top of the pot, resulting in a warmer microclimate for that pot. The other strawberry plant doesn't even have flowers, which might be a problem if they don't pop up soon. The blueberries are plumping nicely. Also, I just added three different varieties of mint (spearmint, peppermint, and chocolate mint) and a jalapeno plant (for my husband.) My porch is now standing room only. But I'm also getting excited about the wild blackberries and wineberries down the road. Last year the black berries didn't do so well, they got attacked by some sort of fungus. I'm hoping this year will be better. Also, I found some strawberries in a small grassy area behind the closed laundromat down the hill. 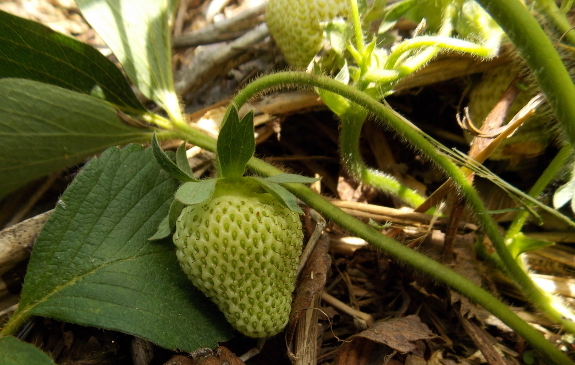 They were clearly not wild strawberries, so I wonder if a bird got one of my strawberries and spread some seeds. I will be watching that with interest and as soon as I have at least one fully ripe berry I will be walking down to see if there are more. I hope they taste good! I'm in your boat as far as strawberries go. They can't ripen fast enough! Our late spring really pushed things by a couple of weeks for sure. It's very apparent in the garden. But! At least we have fresh lettuce and radishes to enjoy for now. I still can't even plant the tomatoes outside because a cold front is moving through, with an expected low of 39 tomorrow night! Also, this is our first year to get apples out of one of our winesap apple trees, so I'm very excited about that. I was surprised that its buds made it through the heavy late frost that we had. My strawberries and raspberries are forming small berries. I figure to be a week or two behind you guys. Boo boo! My peas have not flowered yet but they should flower soon. We are picking young lettice and last winters kale and chard. So I am happy. I've planted the tomatoes and peppers and squash. I will plant my winter squash next week. It seems to be a great start to my garden season.